Buying a boat in SL is easy, or so it seems. You go to a shop or to Market Place and pay. But did you buy what you want or what you expect or what you can handle? I myself own dozens of boats, yes I am addicted, but it also means I have much experience with suppliers and their products. I will give my personal opinion on the boats I own and my experience with the builders in terms of service etc. This does not mean that other suppliers are not good, it simply means I have no experience with them. What to look for in a good boat? So what is important, what should you look for when deciding on a boat? Basically three points. Looks, Performance and Extra’s. Looks are looks and are very personal, so you decide what you like. Big, small, many seats, beds, kitchen, double steering deck, all is possible. 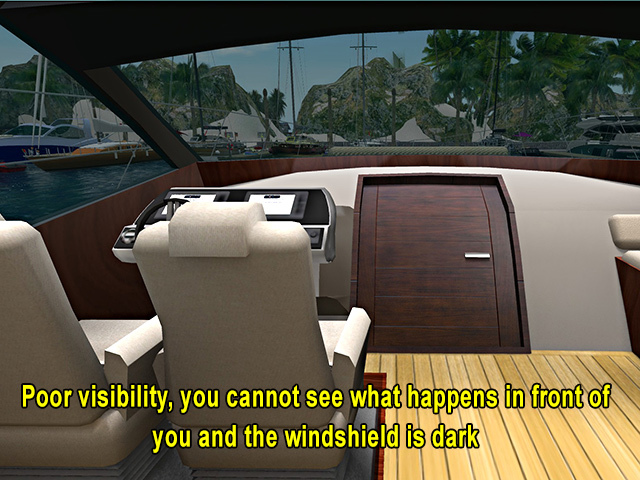 Often your first response to a certain boat is based on what you saw in SL. A serious designer should have an in-world shop with his boats on display and preferably available in a demo setting. Performance is how the boat performs. Steering, speed, region crossing, visibility (how well can you see the rest of the world while sailing). When you are a beginning sailor, performance is not so easy to judge. You cannot really see it, you need to compare to other boats, but you are a beginner right? 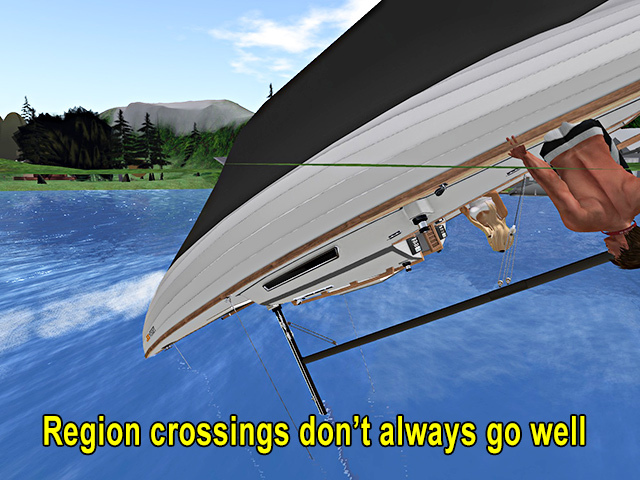 Region crossing is important because its annoying when you crash a lot. Testing with lots of scripts and with a second person on board is a good way to test. Visibility is important too. If you are constantly staring at some wind shield you may run into the ground or worse, that’s not good. Extra’s are for instance animations, how many sits do you have. Can you move from sit to sit without standing up and losing your boat to auto return (no pose balls). Couple animations are another. Back in 2008 boats were all PG, these days they often have adult animations. Some even value an on board TV, I fail to see why, but that’s me. Re-texturing on the other hand is very important, so a designer should add the textures used in the boat. Rocking motion of the boat and foam splashing adds to the reality of the sailing boat. Moving doors, showers, kitchen, beds, fishing and swimming animations also can add to the enjoyment of your boat. You can only test this in a demo or reading the manual before you buy. It often surprises me how little information designers give prospect buyers, it is as if they are scared that too much info will chase clients away. But don’t get carried away, performance is most important. If you have any questions, ask the designer/supplier, if they don’t respond, don’t buy from them, they are not serious. 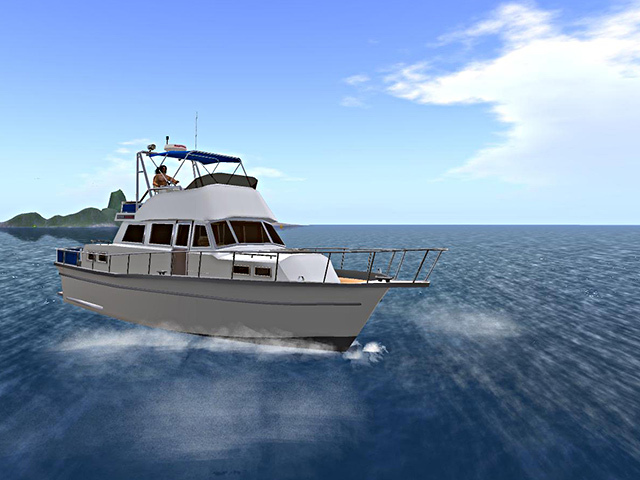 As with so many other things in SL, you can also get a boat for free. There are many free boats and a simple search in SL will give you a whole list. 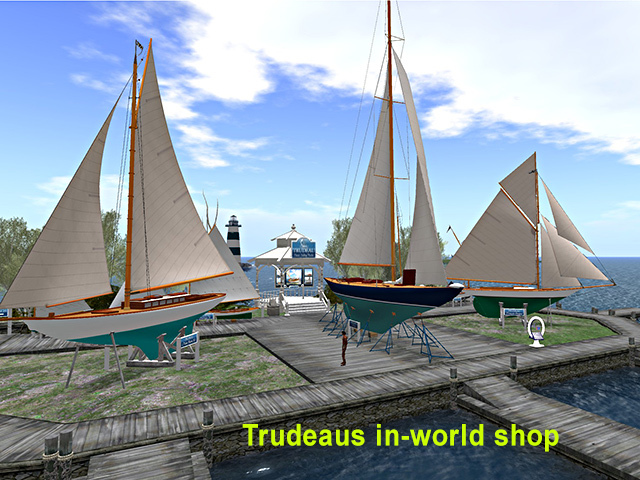 Sailing boats started way back in SL with the Flying Tako, the first boat build in SL by Kanker Greenacre. Based on that design and scripting many others followed, since the code was free. Even today we still see freebee sailing boats build on that principle, most notorious is the Nemo. If you want to experience sailing in SL without spending a dime, head to Starboards Yacht club and get yourself a copy of the Nemo 3. I will not explain here how to sail it, since its well explained in Note Cards. Loon had already build a good name as a bike builder, so his move into boating was new but not illogical. After the introduction of the Oceanic, Loon introduced the Loonetta. This was a huge success because the boat made sailing accessible for a large group of inexperienced sailors. 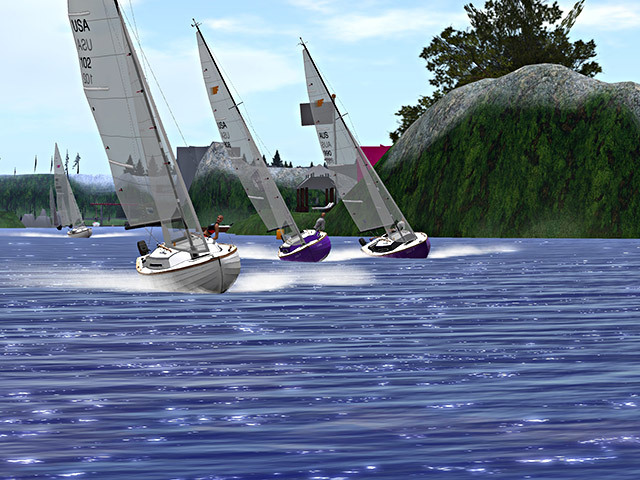 It was no longer just aimed at people who try to mimic RL sailing but made sailing fun for many. I don’t know how many Loonetta’s they sold but it must be many thousands. At 3500 a piece, not bad at all. I have sailed my Loonetta for many years. Pleasurable to sail, realistic steering and has a good engine. An easy to use re-texturing system was installed. The sail setting system with the << >< system was a stroke of genius in my mind, although I don’t think Loon invented it..
Also the ability to move from pose to pose without standing up was a real improvement in places like Blake Sea. No longer were we confined to one cramped position at the wheel with some rocking movement to make it look real. On the downside are also a few things. The boat is fairly small, lacks any meaningful couple poses, is no mod, so extra scripts cannot be added, The attempt to turn an upgrade into a Christmas tree was not a good move in my opinion. No new meaningful product has emerged in boating from Loon since the Loonetta, it seems the designer lost interest in boats. Bandit boats are very popular and for good reasons. 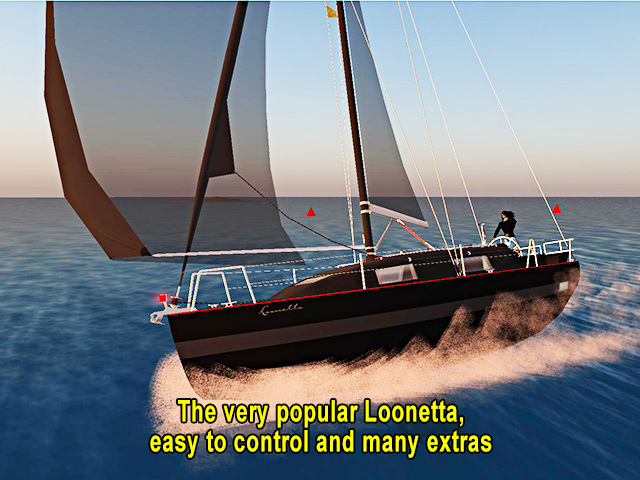 The later mesh designs made by Analyse Dean are very well done and the boats have excellent scripts which making sailing a realistic experience. Popular models are 55 and 60 of which I prefer the 60 because of its clear visual while sailing in mouse look. The 55 cabin prevents that view. The Bandit 60 seems a big hit because you see the boat literally everywhere. I wonder how Analyse will top this one (I am sure she will). Of course the 32 prim limit could no longer be maintained, so if you look for a harbour to park your bandit 60, make sure they support about 150 prims. Other goodies are the build in random variable wind settings, the very clear instruments (although I prefer hover text). Graphics of the boat are supplied even in a few easy to use variations (blue, red and white). Of course you can make your own using Photoshop or GIMP. I talk about that in another page. 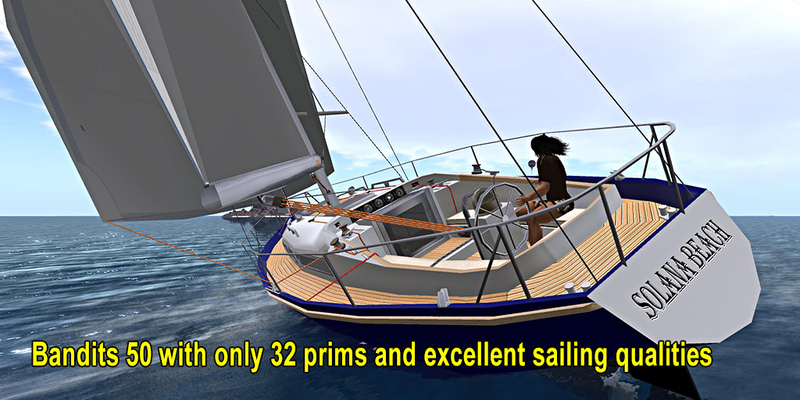 If prim rate is a problem go back to the Bandit 50 which is a nice sailor with only 32 prims. 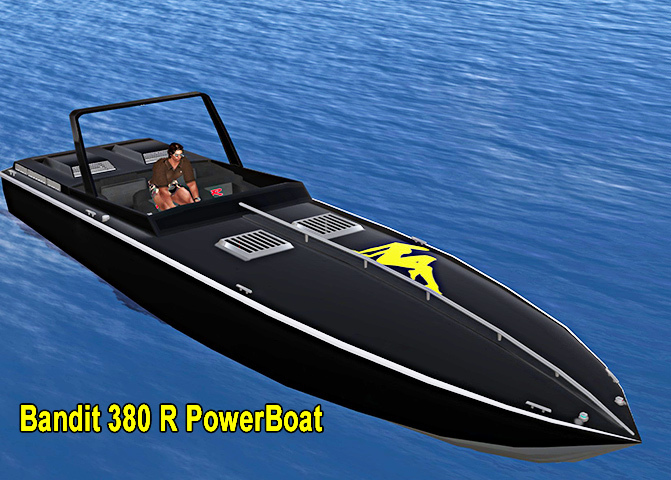 Also in motor boats we see good models as the 380, available both in a normal and Powerboat (R) racing version. Apart from the somewhat odd sitting animations at low speed and the need to refuel now and then, its a very nice touring boat with excellent steering and great sim crossing capabilities, even at high speed >60 kts (yes, 110 km/h). In all the years I had this boat I don’t remember seeing it ever fail a sim cross. The smaller and cheaper sisters are the 280/280R, just as fast and well performing, but smaller. Of the older motor yachts I like the Bandit 480 best because of its high driving seat giving a nice clear view ahead while sailing and still enough space for friends to sit nearby. With 22 kts tops (41 km/h), a nice mom and pop boat. With only 32 prims easy to park in any marina. Recently the 480 was refurbished as the Bandit 480AK with slightly more prims (102) or land impact as its called now (54). Personally I am not very fond of boats with only in board steering like the Bandit 470. It limits your view and is a bit cramped for tall avatars as myself. 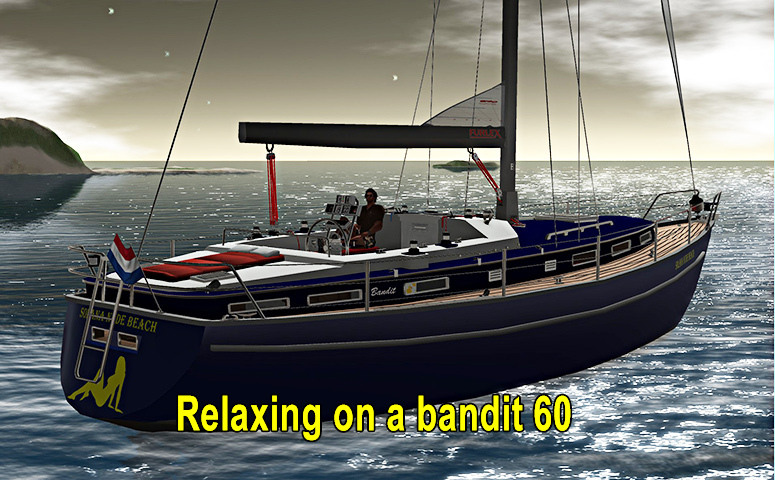 The Bandit If professional sailing boat is a very nice addition to the already impressive Bandit product line. I have to admit, when I first saw it and did a short test drive I was not very impressed. Just another small sailing boat of which we have so many already I thought. But I could not have been more wrong. I really fell in love with this one. Its cute, it has a lot of options, It sails as a boat should sail, has extensive functional instruments, an autopilot function and much more. Above all it is a perfect boat to teach people sailing and do racing. 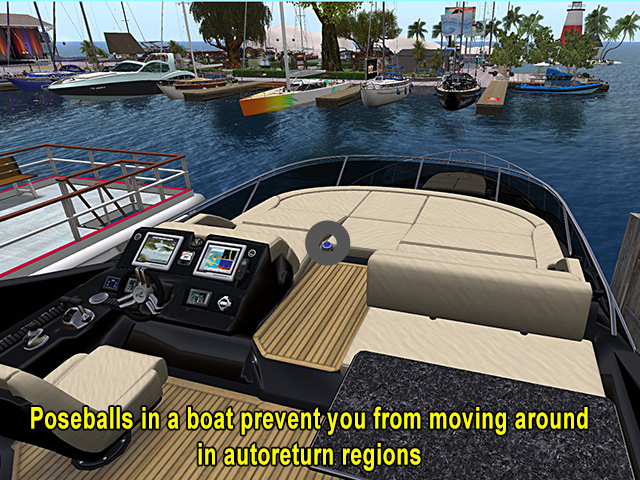 It can only carry two people and when the owner wants to hand over the boat control to the passenger, he or she simply types a command and the passenger has full control. With a similar command he can take back control in case things go wrong or need explaining. Also a great boat for racing purposes. many clubs organize weekly Bandit IF races. Most notably SLIFF and Fruit Islands racing which I organize myself on a weekly basis since 2015. Apart from the perfect IF mesh design, the boat has a few new options like choosing the wind direction between 0-360 degrees. So no longer limited by the familiar N-S-E-W and the in betweens, but any compass direction you want. But let me add its not easy to do this by typing. For my own purposes I created a HUD which set the wind in steps of 10 degrees. I think for most purposes this is sufficient. Other goodies are the Hiking function to counter the strong heeling of the boat. Also this you can do with a key board command, but buttons or gestures (SL macros) are much easier. As with setting the wind direction, also the wind force can now be set in increments of 1 Knot, with a usual maximum of 30 kts, although you can go much higher like 60 or 70 kts. Its fun to sail with 60 kts and hike all the way out trying to stay alive. 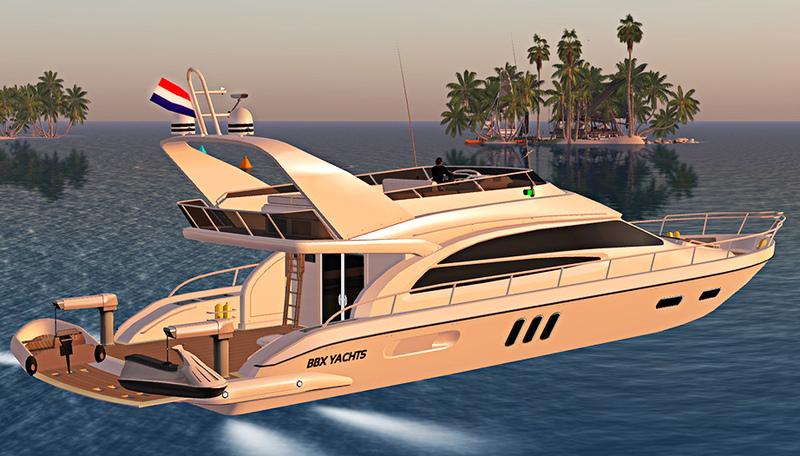 The boat is supplied with a hud which sets sails, hiking and engine speed, mainly meant to be used by your crew member. 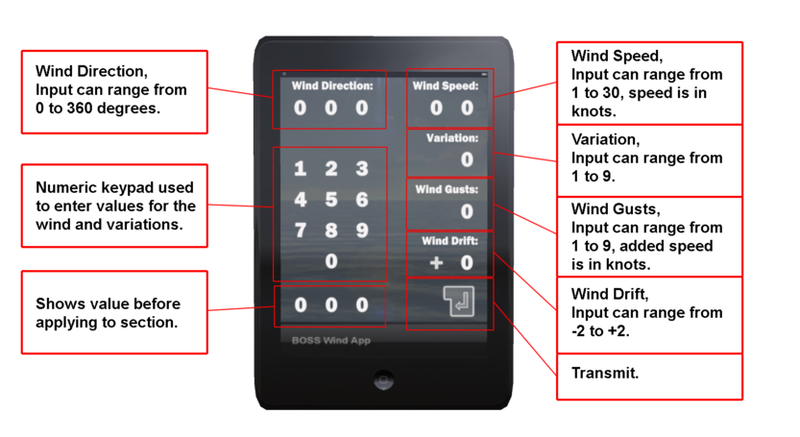 An alternative for wind control is using the Boss Ipad3 from the included Racing pack. With this Ipad you can set wind speed, direction and a host of other settings, mainly meant to be used in an IF race. Just to give you an idea of the functionality I include an image from the original manual. Racing functions are not further discussed here, but are interesting and very well done and thoroughly explained in the manual. The manual that comes with the IF is very well written and covers almost every aspect of the boat, including the racing functions. Other boat builders in SL would do well to take a look and learn from this (and not only boat builders). 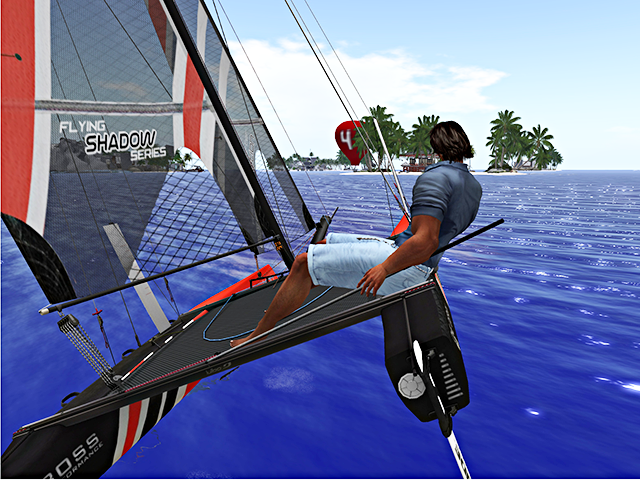 All in all this boat is a must-have if you want to experience top of the line sailing with fun in SL. With only 32 parking land impact an achievement indeed. 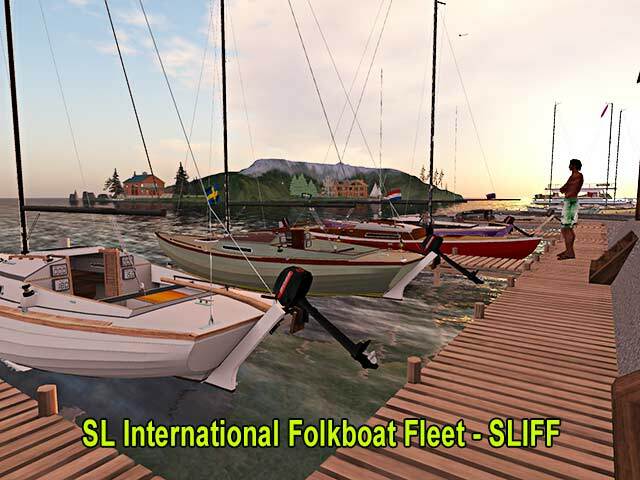 Here you can see the original Folkboat in action in RL and read about its long history. Most Bandit boats, if not all are supplied with the original texture graphics, so you can adapt the textures to make your own design. 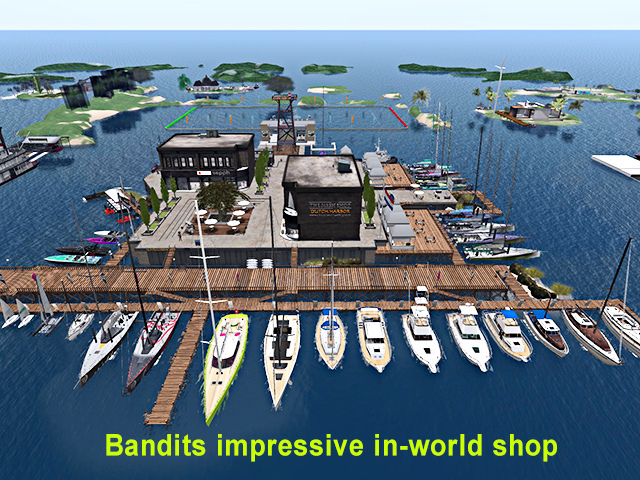 Of course there are many more sailing boats available from this builder Like the Bandit 254 or the cute Laser one. Pay a visit to the impressive Mesh shop in Blake Sea and check it out yourself. 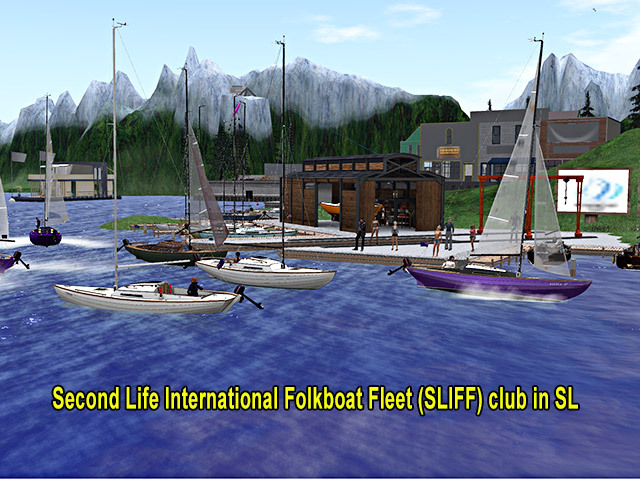 One of the older and well established sailing boat builders in SL. My first boat back in 2008 was a Trudeau Tradewind, a very nice design but in those days you still had to wear part of the boat as an attachment and sit on the rest, which gave hilarious situations if you stood up…. I tried many of Jacqueline’s models like the T12, the Tahiti, the Hepcat, the Epicurus named after a deceased notorious SL sailor, the J-class and of course the ONE. Many of these older models are no longer on sale now because they could probably not compete with the more sophisticated competitors. Today’s best models I think are the New York 30, the Francois Jacques with 5 sails and and the Trudeau 12 Metre which is popular as a racer. Kain, better known as Dutch for good reasons (yes, we Dutch and boats..). He is a wizard with boat scripting, its my understanding he designed the BOSS3 scripting for the Bandit line and others. Latest of Dutch creations is the Ushuaia. A very smooth sailor with the same BOSS engine as the Bandit IF. Its a one-size-fits-all design. 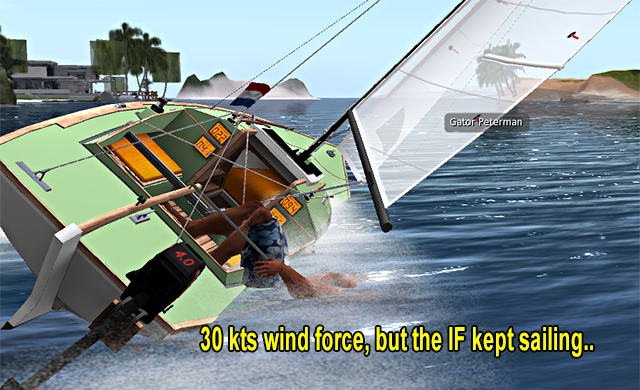 Both for cruisers, racers and people who like to spend a nice time using the many animations. Or the very well designed Ocean Beach. One of my favourites for leisure sailing. The boat can be tested and bought (4k) on the Bandit Dutch Harbor region in Blake sea. A little birdie told me the name of this boat comes from an apparent popular bar on Ibiza island in the Mediterranean. 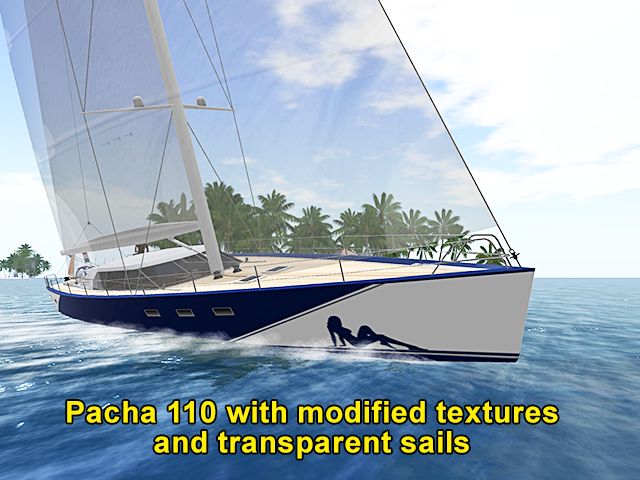 On his own accord Dutch created the Pacha 110, a large fast sailor, first I saw with an autopilot option. Still one of my favourite boats. As a niche product but seemingly very popular the Volvo Open 70 and the One design 65, popular racers in both worlds. I don’t own these boats because you can’t steer them in Mouse Look, but that is just me. It seems to me the Ushuaia will soon be more popular than this Pacha. Other boats are the Bandit 25, fast, nice looks, but a bit overpriced for a Spartan boat without a cabin, animations or any fun stuff. Although I don’t own it, I joined many times on the Nacra, a two person Olympic Class catamaran. Fun to sail, but you need two people to appreciate the full scale of its possibilities. It has recently been replaced by the much more versatile Flying Shadow (see further down). On powerboats the Riva Iseo scores well. With 35 kts fast enough for most purposes and an excellent sim crossing. A new kid on the Dutch block since Oct 2015 is the Flying Shadow. The Flying Shadow is designed to be operated with a crew member. The crew, by using a hud or gestures, can raise and lower the sails, change head sails, trim the sails, lower or raise the dagger boards, help you balance the boat. As introduced in the Bandit IF, giving and taking control can be done quickly by issuing a command. The Shadow has all the goodies of the IF like autopilot, hiking, giving and taking control, setting wind speed in increments of one knot, setting wind direction in steps on one degree, re-texturing etc. You even can get naughty, but personally I prefer a soft bed for that. Control of the stability of the Shadow is done by lowering or raising two dagger boards. It takes some practice to understand the mechanics of this, but it helps to make the boat more stable at high speed. The owners manual is very well written and explains all features in detail. Personally I like this Flying Shadow very much, its a fun alternative to classical sailing. Sitting very close to the water level gives a strong sense of speed and sailing. 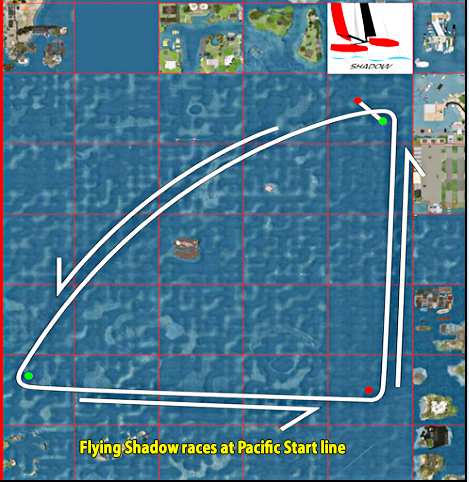 Regular races are organised by the Flying Shadow Club and held at Blake Sea – Pacific Start line, which is near the Dutch Harbour region. 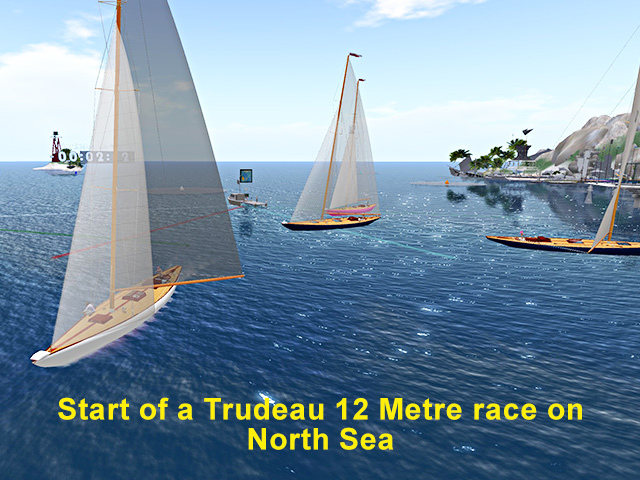 Also Fruit Islands organises regular FS races, start line and info you find here. If you like a posh boat and don’t care so much about performance or prim rate much, than the BBX products might appeal to you. Older models like the Carmen or the Princess looked nice, but were oversized in prims and equipped with lots of pose-balls.The designer likes to present his products as show boats with lots of goodies, not so much for serious sailors. I find their products nice looking, but mediocre in performance and on the whole overpriced. 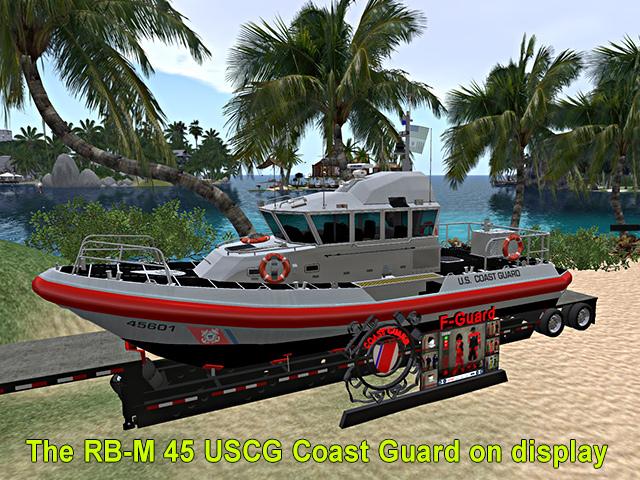 Known for her planes and choppers Tig also created a few ships, one being the impressive RB-M 45 USCG US Coast guard ship now supplied without machine guns (which looked a bit too aggressive for my taste, so I removed them). Once inside this boat you feel no one could ever possibly harm you. Fast, well steered, nice sound and overall well designed, popular with SL Coast guards since it looks impressive and is fast, but not popular for a trip with the family. Here you find Tigs in-world shop.